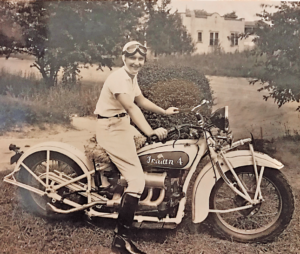 At the age of 99, Atlanta-born Major Helen I. Glenn passed from this life, leaving behind an incredible legacy which includes her time as Jacksonville University (JU) Assistant Dean of Women and later as Director of Financial Aids. Glenn’s Trident Tribute, says retired JU Professor of Education Margaret Janz, was most likely crafted by Martha McGee, then-Dean of Women and Glenn’s direct supervisor. This recognition was only one of many accolades received over her lifetime, including the military cross for honorable military service during World War II, for serving four years in the Women’s Army Corps, both as an intelligence officer and battalion commander, attaining the rank of major. She commanded the first all-female Women’s Army Corps (WAC) battalion, serving in London, Paris, and Belgium, and working with American prisoners of war who communicated through the Red Cross to pass intelligence information which was then decoded by her unit. From riding an Indian four-stroke motorcycle at the age of 15 to smuggling a dog named Sgt. Butch out of Brussels, Glenn led an adventurous life in service to country, kin, higher education, and womankind. She survived the Blitzkrieg along with fellow intelligence officers and British Allied servicemen. When telling of her experience in the European theater, she once said, “I had a strong sense of patriotism, and I knew I could be helpful. There was no reason why I shouldn’t serve my country.” And her time working in American Intelligence did not go without its shining moments, including the Thanksgiving spent overseas when she accepted an invitation to dinner from King George VI and Queen Elizabeth. With this storied background, she returned stateside and earned both a Bachelor of Arts degree from Mercer University and a master’s degree in journalism from Indiana University, at a time when women rarely pursued higher degrees or the then-controversial field, for a woman, of journalism. 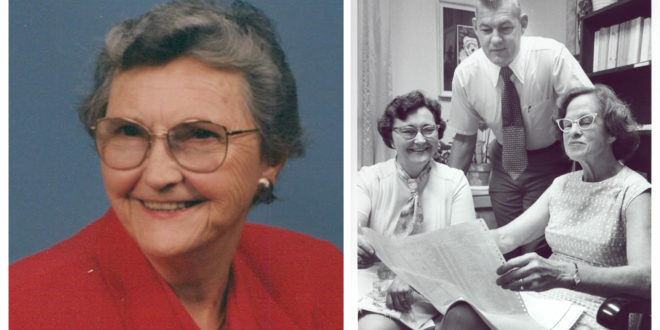 A dedicated alumna of the Alpha Delta Pi (ADPi) sorority, she served as international secretary-treasurer and director of the executive office for nine years, which included fulfilling duties in Berkeley, California; Kansas City, Missouri; and Atlanta, Georgia. She and her father were also instrumental in helping establish the memorial headquarters of the all-women organization in Atlanta, handpicking the historic, three-story home on Ponce de Leon. 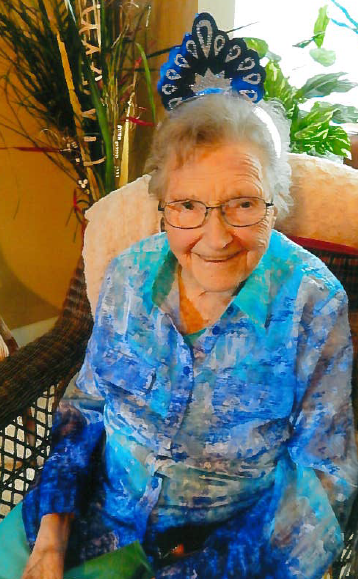 Last September, Glenn celebrated her 75th year of membership in ADPi. Along the way, she added director of public relations and associate professor of journalism at Brenau University and Wesleyan College to her resume, and just prior to arriving on the Jacksonville University campus, she was made Dean of Women at Mercer University. Recruited by Dr. Robert Spiro, then-president of JU, Glenn moved to Jacksonville to become Assistant Dean of Women and later held several administrative titles. After joining the JU administration in 1971, she also served as a member of the faculty and as an advisor to both The Navigator and The Riparian. Glenn’s family confirms that she did that often. Janz says that despite her generosity, or perhaps because of it, Glenn held students to high standards, particularly those who were also members of ADPi. Jacksonville University counts Glenn as one very special link in a long-held connection to the brave men and women of the U.S. military—those who have served, those who continue to serve, and those who have answered the call to serve, including those members of the JU military family—active-duty students, veterans, and the JU Naval Reserve Officers Training Corps (NROTC). A 70-year member of the American Legion, it is important to note that Glenn was employed at JU the same year its NROTC unit was established, when the strong bond that exists today between the University and Jacksonville’s military community first began. Today, the JU NROTC unit is one of the finest in the nation and has produced more than 1,700 ensigns and second lieutenants for duty as officers in the United States military. Today, JU employs more than 50 veterans and retired military on campus, a tradition that did not begin with Major Glenn, but one of which she remains a significant part, with the entire Jacksonville University military community (active duty students; student veterans; Navy ROTC midshipmen; military family members utilizing the GI Bill; faculty veterans; staff veterans) nearing 600. For more information regarding funeral arrangements, or to contact the family of Major Glenn, visit Tom M. Wages Funeral Service. For more details about Jacksonville University’s veteran and military programs and offerings, or about JU as a 100% Yellow Ribbon school, visit us online.